Tens of thousands of people have been ordered to leave homes across Japan after Tropical Typhoon Etau ripped through the country. Military helicopters plucked residents from the roofs of their homes. Lashing rain pounded the country for a second day, and the Kinugawa River has burst through a flood barrier, sending a tsunami-like wall of water into Joso, about 50 kilometers northeast of Tokyo, AP reported. A bullet train service has reportedly been partially suspended. The torrential downpour is also threatening safety at the Fukushima nuclear plant, closed since a 2011 disaster, as it has overwhelmed drainage pumps at the site’s contaminated water treatment facility, a spokesman for operator Tokyo Electric Power (TEPCO) said. 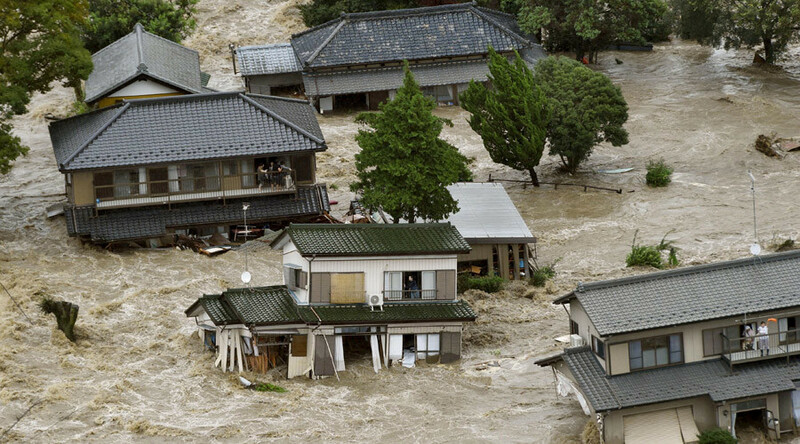 TV footage showed people in the Ibaraki prefecture city of Joso, which lies on the Kinugawa River north of Tokyo, desperately waving towels, waiting for help on the upper floors of their homes engulfed in heavy floods. Some residents called for help standing in waist-high water, national broadcaster NHK reported. Part of a hotel in the town of Nikko, whose ancient shrines and Buddhist temples are listed as a World Heritage Site by UNESCO, has collapsed, the Kyodo news agency reported. There were no reports of injuries. As many as 800,000 people across eastern Japan have been advised to evacuate after local authorities issued pre-dawn warnings of raging downpours to 5 million people, Reuters reported. "This is a scale of downpour that we have not experienced before. Grave danger could be imminent," weather forecaster Takuya Deshimaru told an emergency press conference, according to AFP. In Tochigi's city of Kanuma, rescuers were searching for a 63-year-old woman believed to be buried in mudslides. Her husband was rescued after the slides destroyed houses, NHK reported. More than a dozen people have been injured, including a 77-year-old woman who broke her leg after falling in gusty winds, local media reported. Prevention of disasters and preparation for extreme weather has been one of Japan's top priorities since the 2011 earthquake and tsunami disaster that left nearly 20,000 dead. "The government will stand united and do its best to deal with the disaster... by putting its highest priority on people's lives," Prime Minister Shinzo Abe said.